One of my biggest gripes about buying makeup online is that it’s next-to-impossible to get an accurate foundation match without some sort of assistance. We have to give credit to the retailers who have sophisticated shade-matching tools (looking at you, Sephora ColorIQ) and brands who offer interactive shade charts on their respective sites (like BareMinerals and Tarte). This is where blog posts with clear photos and descriptions are so important! This is also where a good ol’ crowdsourced blog post and comments come into play. I’d love to know what color foundation you wear in the various nontoxic cosmetics brands on the market today. To kick it off, see my skin description and list below. Also, as you can tell in the photo collage below, proper lighting is key to be able to see true makeup colors in photos! I’m no professional photographer, nor do I have a studio or fancy lights. 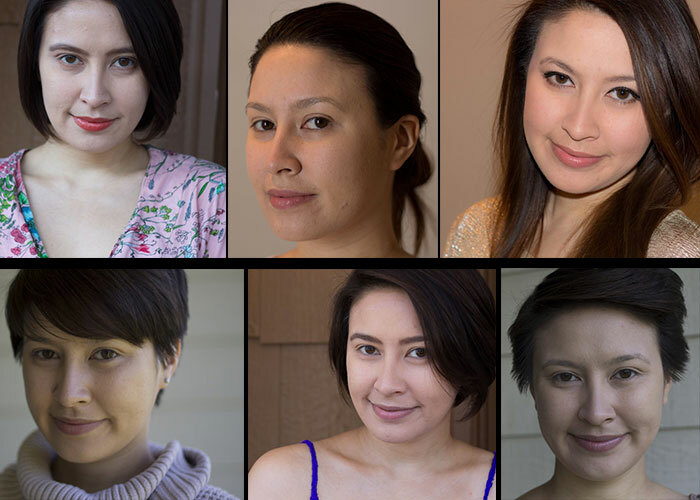 From top left going clockwise, here are the lighting conditions as much as I can remember them: Outdoors; indoors; indoors with flash; outdoors with the wrong white balance setting; outdoors; outdoors with the wrong white balance setting. Other things to note: Camera settings are important! I shot some of my older posts with the wrong white balance setting. Sorry! I’m a writer, not a photographer. Skintone: Light with yellow / warm-neutral undertones. Middle of face can be slightly pink thanks to pigmentation issues. Neck & chest show yellow undertones, but can be a bit blotchy. Skin Attributes: Tans easily. Will sunburn pink/red without proper protection, but only after extended period of time in extreme sunlight. Note: I’ve starred** the ones I think have an exceptional color match for my skin. Another Note: The ones that aren’t starred are still great, but as we all know, foundations are just hard to match. Some of these lack the right amount of yellow for me or are a bit too dark or a bit too light or may even be too yellow. What’s nice about having an arsenal, though, is being able to create custom blends! OK, so that’s a LOT of color intelligence for you. Your turn! Leave your skin description and foundation shades in the comments section.